Cravens left the team before Week 1 while pondering retirement. The Redskins had a month to decide what to do with the 2016 second-round pick and opted to rule him out this season. Amid injuries to more than a quarter of their starters, the Washington Redskins won't have Su'a Cravens for the rest of the season after putting the 22-year-old safety on the reserve/left squad list. Cravens left the team before Week 1 while contemplating retirement. The Redskins had a month to decide what to do with the 2016 second-round pick and opted to rule him out this season. "We sincerely hope that Su'a uses this time away from the club to reflect upon whether or not he'd like to resume his career in the National Football League in 2018," the Redskins said in a statement on Monday. Washington could have used Cravens with so many injuries in the secondary going into its game on Sunday night against the Oakland Raiders. Cornerback Josh Norman and strong safety Montae Nicholson — who was starting where Cravens was supposed to play in his second season — each has a sprained shoulder, while special teams ace and backup safety Deshazor Everett has a sprained MCL in his knee. Coach Jay Gruden said on a conference call that if Nicholson and Everett aren't 100 percent, the team would consider promoting Fish Smithson from the practice squad. Following an NFL Network report on Sunday that Cravens was set to rejoin the team this week, Gruden said he hadn't heard anything about or from Cravens. "The last time I talked to him was when he informed me that he was leaving," Gruden said. "So that's all I know." Cravens was seen on the sideline with Redskins senior director of player personnel Doug Williams on Saturday in Los Angeles before his alma mater USC's game against Texas. Agent Fadde Mikhail retweeted the photo with the message: "Su'a hanging out w Doug Williams. The end." It's actually just the end of Cravens' season, one that was supposed to include a substantial role with Washington after converting from inside linebacker to safety. "As far as him understanding if we want him or not, obviously he knows that," Gruden said on September 5. "We drafted him in the second round, for goodness' sake. We've given (him) every opportunity to be a starting safety here and he's taken advantage of that opportunity and played well in the time that he was playing it. He was growing with the position. This just kind of came out of nowhere." With the Cravens situation settled for the rest of the season, the Redskins go into their Week 3 showdown with the 2-0 Raiders with injuries on each side of the ball. In addition to Norman, Nicholson and Everett, running back Robert Kelley has a rib cartilage injury, tight end Jordan Reed has a bruised sternum in his chest, right tackle Morgan Moses has a sprained ankle and strained shoulder and linebacker Mason Foster has a dislocated shoulder. "Rob Kelley's a tough guy," Gruden said. "I think he'll try to play with that thing, but you never know how much pain he's in. We'll see how that rib heals. Same with Jordan, same with Josh, same with Montae, same with Mason, same with Deshazor, same with Morgan. They're all a concern, but they're all tough guys and hopefully we'll have them." 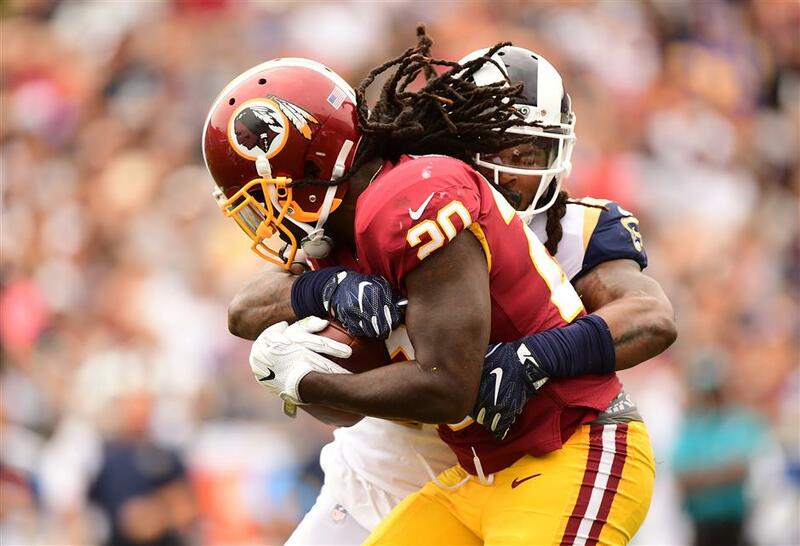 Robert Kelley (front) of the Washington Redskins is tackled by Mark Barron of the Los Angeles Rams during their NFL game at Los Angeles Memorial Coliseum in Los Angeles, California, on September 17, 2017. Kelley is suffering from a rib cartilage injury ahead of the team's September 24, 2017, clash with the Oakland Raiders.